Churchkhela (Georgian: ჩურჩხელა, Georgian pronunciation: [tʃʰurtʃʰxɛlɑ]) is a traditional Georgian candle-shaped candy. The main ingredients are grape must, nuts and flour. Almonds, walnuts, hazelnut and chocolate and sometimes raisins are threaded onto a string, dipped in thickened grape juice or fruit juices and dried in the shape of a sausage. The traditional technology of churchkhela in the Kakheti region was inscribed on the Intangible Cultural Heritage of Georgia list in 2015. 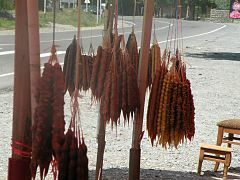 Churchkhela and its varieties are popular in several countries besides Georgia, such as Iran, Armenia, Cyprus, Greece, Russia, Ukraine, and Turkey. In Persian, it's known as "Lævascæck Adjili" (لواشک آجیلی). In Armenian, Greek, and Turkish it is known as "sujuk", which is actually a dry sausage. To distinguish the two, it is sometimes referred to as "sweet sujukh" (քաղցր սուջուխ, kaghtsr sujukh) in Armenian and cevizli sucuk ("walnut sujuk") in Turkish. It is known in Cypriot Greek as shoushoukos (σιουσιούκκος) and as soutzouki (σουτζούκι) in Greece. The Cypriot variety is made by dipping strings of almonds into jelly, called palouzes (παλουζές). Churchkhela is a homemade Georgian product. Georgians usually make Churchkhela in Autumn when the primary ingredients, grapes and nuts, are harvested. It is a string of walnut halves that have been dipped in grape juice called Tatara or Phelamushi (grape juice thickened with flour), and dried in the sun. No sugar is added to make real Churchkhela. Instead of walnuts, sometimes hazelnuts or almonds are used in the regions of west Georgia. The shape of Churchkhela looks like a candle. Georgian warriors carried Churchkhelas with them because they contain many calories. The best Churchkhela is made in Kakheti region, which is renowned as the motherland of wine. The juice is placed in a large bronze cauldron and heated slowly. A small amount of a special white earth called asproi is added to the boiling must and causes impurities to rise to the surface, where they are collected and removed. It is possible to substitute asproi, when not available, with lager beer, which has a similar result. Once the cleansing process is complete, the liquid is left to cool. Next, flour is added while stirring and heating the mixture. When it reaches the right consistency, based on the rate of steam bubbles and the viscosity of the mixture, it is removed from the heat. The mix, called Badagi, is now ready for use in the next step in the process of making Churchkhelas, which consists of preparing the nuts for dipping. Before they are threaded, the nuts have to be shelled and dipped into water in order to soften them. Once soft enough, they are strung onto 2-3 meter-long threads. The strings are dipped in the Badagi mixture until completely covered. 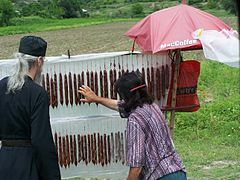 This process is repeated several times (usually three times) until the Churchkhelas has the desired thickness. Churchkhelas strings are then left to dry for 5–6 days. They are then ready for consumption or storage, even though some people like to eat it fresh. ^ Goldstein, Darra (1999). The Georgian Feast: The Vibrant Culture and Savory Food of the Republic of Georgia. University of California Press. p. 210. ^ Чурчхела. langet.ru (in Russian). Culinary Dictionary of V.V. Pokhlebkin. 2002. Грузинское национальное лакомство. ^ Roufs, Timothy G.; Roufs, Kathleen Smyth (2014). Sweet Treats around the World: An Encyclopedia of Food and Culture. ABC-CLIO. p. 140. ^ a b Zeldes, Leah A. (2011-03-02). "Eat this! Rojik, something sweet from Armenia". Dining Chicago. Chicago's Restaurant & Entertainment Guide, Inc. Retrieved 2011-06-30. ^ "არამატერიალური კულტურული მემკვიდრეობა" [Intangible Cultural Heritage] (PDF) (in Georgian). National Agency for Cultural Heritage Preservation of Georgia. Retrieved 25 October 2017. ^ "UNESCO Culture for development indicators for Georgia (Analytical and Technical Report)" (PDF). EU-Eastern Partnership Culture & Creativity Programme. October 2017. pp. 82–88. Retrieved 25 October 2017. ^ "Soutzoukos". hellenicaworld.com. Hellenica World. 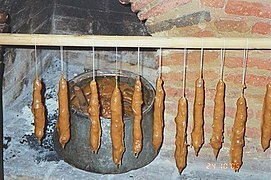 Soutzoukos (Greek: σουτζούκος) is a popular traditional sweet of Cyprus. ^ "Как сделать чурчхелу в домашних условиях [How to make churchkhela at home]" (in Russian). mail.ru. 10 October 2013. ^ "Going nuts in Pangaltı, Şişli". Hürriyet Daily News. 29 January 2010. 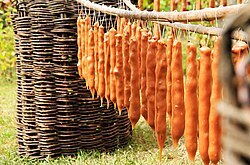 ...the cevizli sucuk, a traditional, sausage-shaped candy made of walnuts sewn onto a string and dipped into thickened mulberry juice. ^ "Shoushoukos". cyprusalive.com. Cyprus Alive. Palouzes and shushukos are exclusively known as traditional Cypriot delicacies. ^ Cyprus. Hunter Publishing. 1999. p. 231. Soutzoukos is a solidified grape juice sweet made with almonds and formed into sausage-like rolls. ^ "Σουτζιούκκος". foodmuseum.cs.ucy.ac.cy (in Greek). Cyprus Food Virtual Museum. Retrieved 30 November 2015. ^ "Authentic Foods Soujoukos & Palouzes". cyprusfoodndrinks.com. Cyprus Food and Drinks. Soujoukos (grape must roll): A similar name, soutzouki, is also used in Greece to denote the same product. ^ Progress Tour. "Churchkhela". Retrieved 2012-11-19. This page was last edited on 3 April 2019, at 04:29 (UTC).